Part of the former districts of 豊後国 Bungo and 豊前国　Buzen. They are made from wood by Isobe Ouson 磯辺鴎村. They look almost like small robots, just 5 cm high. See also dove mikuji, below. They come in auspicious red and white to ward off evil. They are sold during the lion dance festivities at the beginning of the rainy season to ward off evil and bring a good harvest. This dates back more than 400 years to the first regent, Ootomo Yoshinao 大友能直.
. Lion Head Amulets . 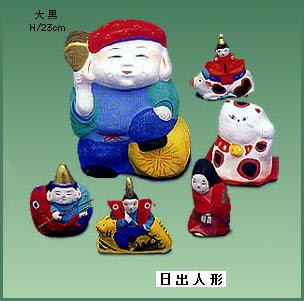 Ootomo ningyoo 大友人形 Otomo dolls . An amulet to ward off evil. 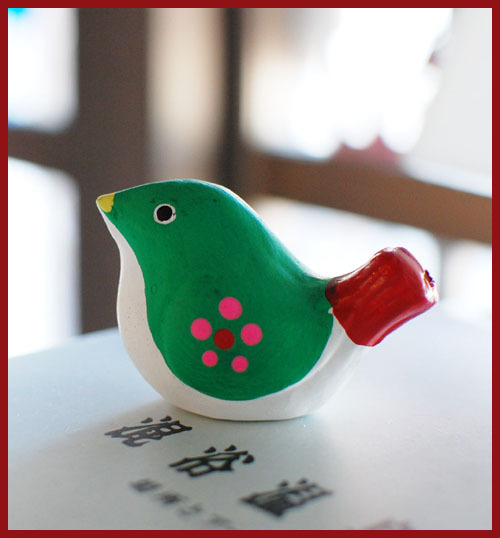 At Usa Hachimangu 宇佐八幡 / Shrine Usa Jinja 宇佐神社 a white clay dove was given as a present to people with good luck at their mikuji. Now it has become a well-loved clay doll. They have been made in Isobe Ouson 磯辺鴎村, like the auspicious lions, see above. They are about 7 cm long and 6 cm high. They were first made by 溝口興四郎, a papermachee-doll maker. At the breast of the dove there stuck a paper with the inscription 県指定宇佐神社みくじ鳩 (Official dove sacred lot from Usa Shrine). When the paper was torn away, the mikuji paper could be taken out of an opening in the dove's breast. 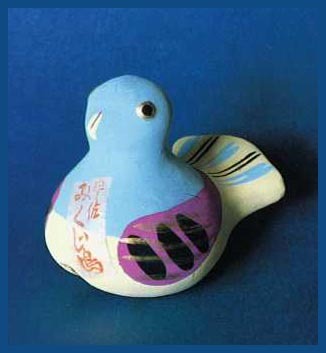 After the war, these doves were made in Isobe Ouson 磯辺鴎村 as clay dolls. But when their maker was no longer able to produce them for the shrine, this custom died out. To revive it, 豊泉堂 Bunsendo begun to make them again as souvenirs.
. mikuji 御籤 fortune-telling with sacred lots .
. nanbansen, nanban no fune 南蛮船 boat of foreigners .
. takezaiku 別府　竹細工 Bamboo ware from Beppu . dip it in Camellia oil overnight before using it. This will make your hair even more luscious. By the way, Japanese Sumo wrestlers use Camellia oil for their hair, too! Camellia oil is light and does not harm the comb. You can use a small plastic bag for the comb and oil. Before using it, you must remove any excess oil. 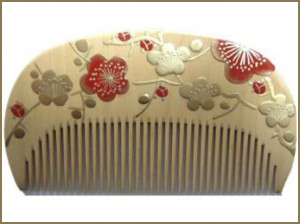 You may want to repeat the above steps once in a while so that the comb is always well lubricated.
. tsugegushi 柘植櫛 comb from boxwood .
. yokanbee よかんべえ Yakko kite . from Takeda 竹田, Usuki臼杵 and Bungo Takata 豊後高田. Hiji 日出（ひじ） is a small village at the edge of Kunisaki hanto peninsula 国東半島. 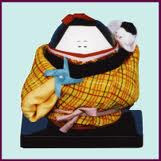 They were made by Monjoo Osamu san 門上修, a designer from Oita, who started making dolls in 1988 together with his wife. Apart from clay bells he made about 100 different figures. former 天領 Tenryo government land, with a rich cultural heritage ! 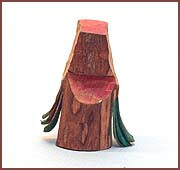 This is a very simple carving for exchanging bullfinches. It almost looks like the "spirit of the forest" . The shrine Tsunomure jinja 角埋神社 is located in the compound of the old castle of Tsunomure 角牟礼城跡 on the foot of Mount Tsunomure (577m) in Kusu village. Minamoto no Tametomo 八郎源為朝 is venerated in this shrine. The castle was built by Mori Tomomichi in the Koan period (1280). During Japan's period of civil war, Tsunomore held a key position between various states and was fortified by the people of Kusu. In the 14th year of the Tensei period (1586), the castle withstood an attack by Shimazu Yoshihiro. Today, stone walling some 7m high and 100m long still remains. Moreover, excavation since 1993 has found traces of a watchtower and a gateway dating to the period of Mori Takamasa, who ruled from the castle in the Toyotomi period. There are also remains of another stone gateway and a stone building measuring 10m by 6m. In 2004, Tsunomure Castle Ruin was designated a national historic site. was a samurai who fought in the Hōgen Rebellion of 1156. He was the son of Minamoto no Tameyoshi, and brother to Yukiie and Yoshitomo. ... Tametomo is known in the epic chronicles as a powerful archer and it is said that he once sunk an entire Taira ship with a single arrow by puncturing its hull below the waterline.
. Tametomo in Hachijo Island, Tokyo .
. Tametomo in the Daruma Museum .
. Nakatsu mikoshi　中津神輿　Nakatsu Festival Float . from 長浜神社 Nagahama Shrine, with a special hall for these dolls, 絵馬堂. Made in a long format to stand, from cedar wood 杉板, about 18 x 11 cm. 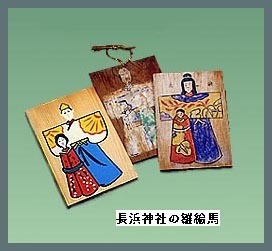 The wooden plates are painted with the Hina dolls. The two deities of the Shrine, 大国主命 Oonmuchi no mikoto and 小彦名命 Sukunahikona no Mikoto are seen as 医道の祖神 deities of Medicine. The larger figure on the plate is Oonomuchi, the smaller one Sukunakikona. These two were also printed on paper as amulets, to protect from fire and disasters.
. kubi ningyoo 首人形 head dolls / kushi ningyoo 串人形 dolls on a stick .
. oni ema, oni-ema 鬼絵馬 votive tablet with demons . yusu, isu no ki イスノキ - 柞 / or ハハソ 蚊母樹, a kind of oak or mansaku. 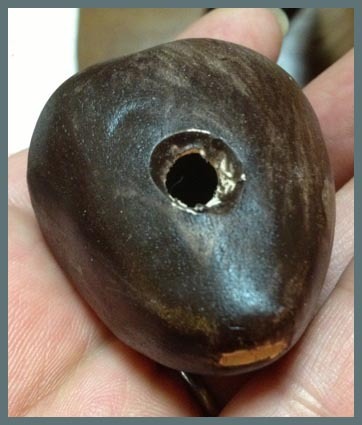 The seed of the tree is eaten up by insects and the empty shell used as an amulet and toy for children..
. Usa Hachimangu, Oita 宇佐八幡宮 . 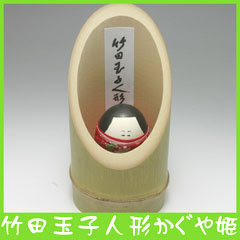 Click for more Egg dolls from Takeda town.
. 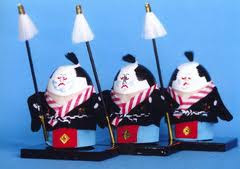 Egg dolls from Fukui . 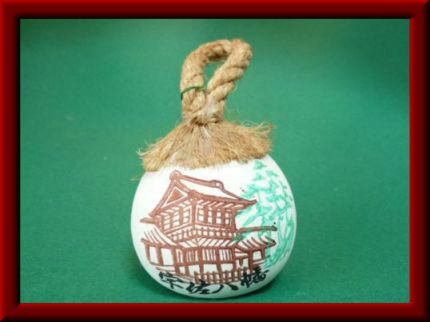 takegoma, take-goma 竹ごま bamboo spinning top. Made from round bamboo, with holes to let the wind blow through for a sound, ブーン buuun. Made by Hatano san - 波多野晃郎：竹田市玉来733-1.
. unarigoma うなりごま from Kyushu . Made from wood, on a spinning wheel. The stick is made from metal. The fight aims at destroying the top of the adversary. Made by Taniguchi san 谷口喜三郎「梅喜工房」：海南郡宇目町千束3062-3.
. Spinning Top 独楽（コマ） koma - Introduction .
. magaibutsu 磨崖仏 cliff Buddha statues .
. ura yakko tako　裏奴凧　Yakko from the backside .
. Oita Folk Toys - this BLOG .